There’s something rather enticing about crowdsourcing. As many people as you can reach, working to deliver a solution to your problem. The embodiment of many heads being better than one. It’s also a term that seems to cover a broad base. 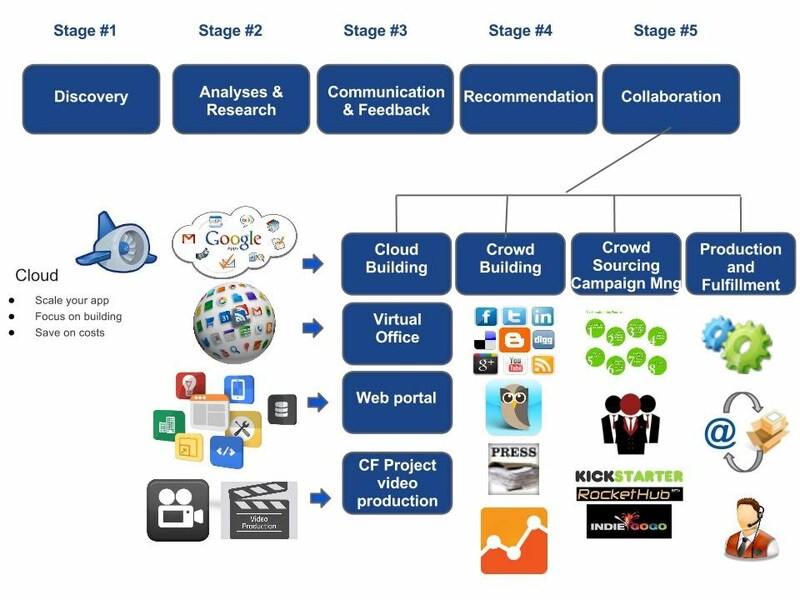 Yes crowdsourcing has a crowd of applications. From the individual on Twitter who ‘crowdsources’ where to buy the best value mobile device, to the research scientists assembling a far larger sample than would be possible through traditional methods. Application in business is gaining traction. For many, using social networking sites has given instant access to a customer crowd that represents a more powerful presence than the classic survey panels. It’s safe to say that although you could point to something like the Domesday Book as being early crowdsourcing, the arrival of the Internet and more specifically, social technologies have driven the approach forward. But for all this power, something holds the business community back from trusting everything to the crowd. As with anything exciting, there’s the element of risk. It may be fantastic PR to offer customers the chance to create an ad for the Super Bowl break, but putting together the professional production and delivery standards – that’s a different story. Katy in Kettering may hold the key to the next air conditioner fragrance, but the FMCG brands will wait for their suppliers to design the brand to go with it. Enter expertsourcing. It’s not just the next stage of crowdsourcing, but the logical progression of outsourcing. Instead of the world at large contributing, a crowd of skilled professionals, organised by those skills and experience are available to tap into. It’s a way of gathering expertise en masse, ensuring that you can discover multiple sources able to deliver from concept to production. It’s about tapping into knowledge, but without the restriction of single suppliers, geographical reach, or long-term tie-in. That’s why it’s potentially the outsourcing replacement. You create a new relationship as each new requirement comes along – one that fits 100% each time, rather than reaching an 80% compromise. It’s not quite as free form as crowdsourcing. First of all expert crowds don’t create themselves. They need organisation and curation. They self-generate – after all one of the advantages of experience is knowing where your gaps are, and you tend to fill them from existing networks. Curation is key: rather like the arrival of the citizen journalist creating new sources and stories, there’s a layer of credentials checking that everyone employs to just be sure. Expertsourcing promises to be the business solution that changes how projects are sourced. Perhaps more controversially, knowing that there are experts in every field available for instant and direct access, business leaders may re-evaluate their in-house resources. With many organisations recognizing that there is just too much fat, but wary of the offshore and outsourcing models that haven’t always delivered the expected results, a way to get the best of both worlds could be very appealing. An experience CrowdFunder which has completed a success full CrowFunding would tell you that the most important elements of CrowdFunding campaign is your CrowdFunding expert team . The entrepreneur , SMB or Start up needs to know where are the gaps and fill them with CrowdFunding mentors or consultants . Expert sourcing is fundamental new and its Business process Crowdsourcing. It is a method to ask the Expert Crowd to participate on your CrowdFunding campaign before , during and after . ( see attached diagram ). This is the art of building your support team in the cloud which can assist you from Discovery phase to successful CrwodFunding campaign and finally through production , fulfillment and project and customer support . Expertsourcing promises to be the CrowdFunding solution that changes how CrowdFunding projects are sourced. Perhaps more controversially, knowing that there are CrowdFunding project experts in every field available for instant and direct access, business leaders may re-evaluate their in-house resources. Using Information gathered in the discovery phase, we analyze and research the overall concept and each of the main categories outline in the Concept definition. This phase involves building on the data from the Discovery phase, bringing to bear practices, Crowd building methodologies, standards Into a reference framework and best practices. We solicit your input after completing our detail analysis and research to make sure we are aligned with your vision and mission. Recommendations are then made on each of the identified applicable items in detail. This includes the breakthrough road map and results analysis of your current “Crowd Assets”. You can choose to use our research and recommendations to achieve your goal &/or secure the assistance from our Mentors and Consultant to help you to build your business and Campaign. Consultants can help you on each specific subject and as mentors can guide, analyse and recommend actions through Campaign Building Process.